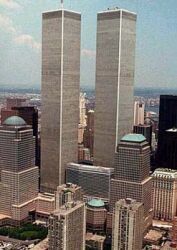 The World Trade Center Complex consisted of seven buildings on a 16-acre site in Manhatten. Six of the buildings surrounded the 5-acre Austin J. Tobin plaza, while 7 World Trade Center was located across Vesey Street. The complex was connected by pedestrian bridge to the 3-building World Financial Center across West Street. Battery Park was created when 1.2 million cubic yards of earth were excavated from the World Trade Center site and dumped into the Hudson River. Click Here to view a site plan of the area or Click on any of the following for further information. Please note: Tenant listings are for those who occupied space on September 11th and are not current.